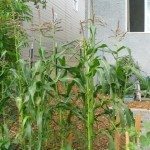 The corn stalks in my garden have only gotten 2 1/2-3 ft. The ears are growing but are maturing only approx 3 inches long and aren't filled in. Do I need to add a specific fertilizer? Did I plant too late? What causes this? Premature tasseling of corn (producing ears before the corn is at its mature height) normally occurs because the plant is under stress of some kind. Without more information, I cannot tell you what is causing the stress. Take a look at the conditions that the corn is growing in and see if anything can be improved - such as more water, better drainage, more nutrients. You cannot save this season's crop but you can help avoid it for next time you plant if you can figure out what caused the stress.